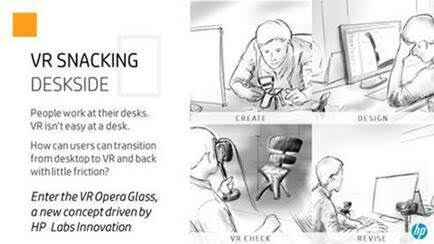 HP Inc. is looking to make virtual reality (VR) snacking a reality with the HP Opera Glass. In a press release, HP Labs appended an extremely brief segment regarding a new concept called VR snacking. Basically, it’s a way for users to quickly switch between their monitor and 3D VR. From the statement, it sounds like HP is suggesting that VR view will run concurrently with desktop view, and anyone who wants to take a peek can do so without impeding workflow. It also introduces the potential for a quick VR collab session with real-time feedback. The headset will need some adjustments, perhaps forgoing the straps. HP showed a mock-up VR headset with a stick attachment. HP also stresses that this is purely a proof of concept product and therefore has no pricing or official HP names.